To unite for a common cause – Making the world come together to observe this day as a World CSR Congress each year. 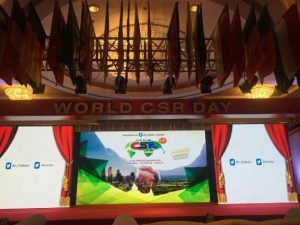 The World CSR Congress is guided by Leaders…. Leaders who believe in the value of Sustainable CSR; that which is built in the fabric of business – making it a reality. Leaders produce Leaders program will be a common thread uniting nations and people who take CSR more responsibly. They also believe that CSR is a tool to the Development of the Future. Leaders, Professional, CSR Associates, CEOs, Sustainability Experts and Media honchos are a part of the Advisory Council. They are in different parts of the world and help in spreading the message of World CSR Congress. At the end of the exercise CSR best practices awards were presented, intending to cover 100 countries – in length and breadth of the Geography. The World CSR Congress also felicitates the Organisations with Gold, Silver and Bronze awards to those the CSR Practices which help make a difference to the society and community at large. Cities Leaders, taking part in the event and gaining a special recognition for that.